Description: I thought I would get some old shots posted since the canyon is changing. This is the third bridge from the east. Description: An eastbound trailer train is about to pass under Highway 10 in Hardin. Description: Q269 with BNSF power. 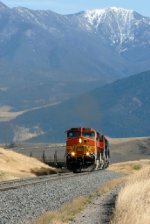 Description: BNSF 4765 leads a grain train up Bozeman Pass. It's September, but there's already snow in the higher elevations. Description: NS Croxton Yard local HC10 with autoracks for the NYS&W. Description: NS Croxton Yard local HC10 bringing autoracks from the NYS&W. Description: 17th Ave., 0636 hours. Description: You can see the old overpass walls under the bridge.